The McCall Motorworks Revival 2012 was held Wednesday, August 15th at the Monterey Jet Center in Monterey, California. Nearly 3,000 guests enjoyed Gordon McCall’s 21st annual Motorworks Revival event and charitable fundraiser, which again featured classic cars and private jets mixed in with the latest offerings from top luxury brands in an elegant party setting. “Each year, we build the event from the ground up starting with our guest list and every year I am astounded to meet people from all over the world who have heard of the event and would like to be a part of it. There’s a lot to do and see on the Monterey Peninsula over the week in August and we love being a part of the exciting energy,” said Gordon McCall, the eponymous founder of the Revival. From Breitling to Pagani, brands on display at McCall Motorworks Revival 2012 included Aston Martin, Ferrari, Fisker, Koenigsegg, Lamborghini, Lexani, Lexus, Lotus, Maserati, in addition to Embraer, Gulfstream, Tempus Jets, Flight Options, Shearwater Air, Piltaus, and Piaggio. A reception in the main courtyard featured the latest offerings from Lexus and a selection from Barrett-Jackson’s Salon Collection. 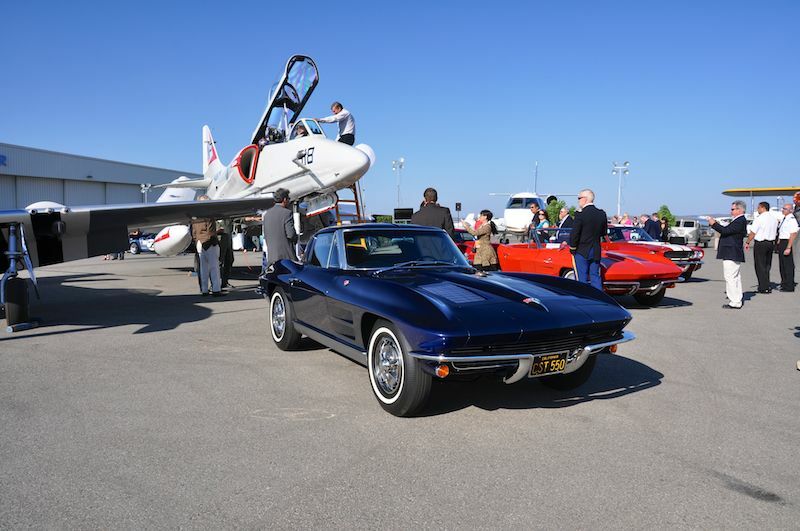 Racing legends such as Jim Hall, Bobby Rahal, Eddy Lawson, Wayne Rainey, Jim Busby and Danny Sullivan joined others roaming the hangar and adjacent 6+ acre tarmac loaded with classic automobiles, fighter jets and corporate aircraft.